Trains run to Grays and Chafford from London Fenchurch Street, West Ham and Southend. If someone close to you wants to make a visit to Lakeside say “yes”. While they are shopping you can have a very different experience on this walk. Take the short bus ride to Grays station and start the walk. 1). Leave Grays Station via the exit on platform 2. Cross the road in front via the crossing and turn left past the bus stops. Near the end of the bus stops turn right into Morrisons supermarket. Walk towards the main entrance but do not enter the shop. Instead turn left and then, almost immediately, right along the edge of the building. Now keep straight ahead along the edge of the car park. A road joins you from the right, so that you are now walking along the pavement to the road. Keep straight ahead to a large roundabout. Continue ahead, crossing the road which goes off to the left from the roundabout. Continue ahead, slightly uphill with industrial and commercial buildings on both sides of the road. The last building on your left is a petrol station. Immediately after this there is what looks like a small gap between the petrol station fence and a hedge. There is no sign. 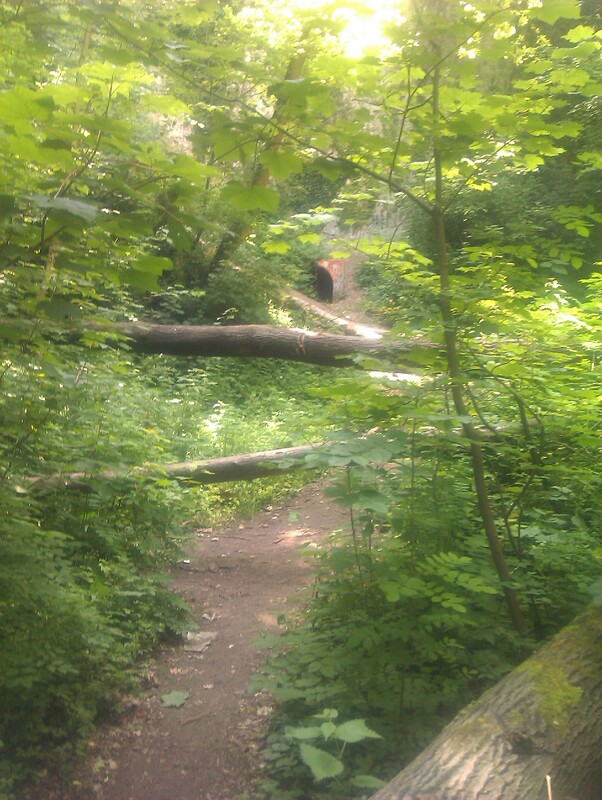 This looks un-promising, but go through the gap and you will find a clear footpath. Follow this. You quickly come to a junction. Turn right here and follow an increasingly broad track through woods and small meadows. You will be able to hear the road on your right, but the view is of tranquil country. At the end of a meadow you come to a junction. Alternative route 1 goes to the right. The alternative route goes through a number of woods and meadows and it particularly good for wildflowers, including Orchids in June/July. Here you can find the largest concentration of rare Man Orchids in Essex. However there will be traffic noise from the nearby roads and you will miss out on Grays Gorge. To follow this route simply keep on the main path after the junction. It re-joins the main route later on at a point where a clear path turns to the left. The main route bears left and goes down steps into the gorge. At the bottom of the steps turn right, over a small bridge. Continue to follow the path. You can see on the path some remains of old railway tracks. Come to a junction with a track. There is an oversized seat slightly to your right. Alternative route 2 goes right here, taking short cut to the lake at point 2. To take this alternative follow the track to the right. After a while it bears slightly left to reach the lake, which is initially hidden by trees and bushes. At a point where the track turns left away from the lake you are at point 2. Turn left to re-join the main route. The main route turns left at the junction and crosses an open area before entering woodland. As you enter the woods you may be able to see modern houses in front of you. The path bears right and there are tracks to the left leading to the houses, but you continue bearing right. The attractive path continues with cliffs on your left. Come to a clearing. There is a path to your left which you will take shortly, but for now continue straight ahead past another oversized seat to reach the lake. 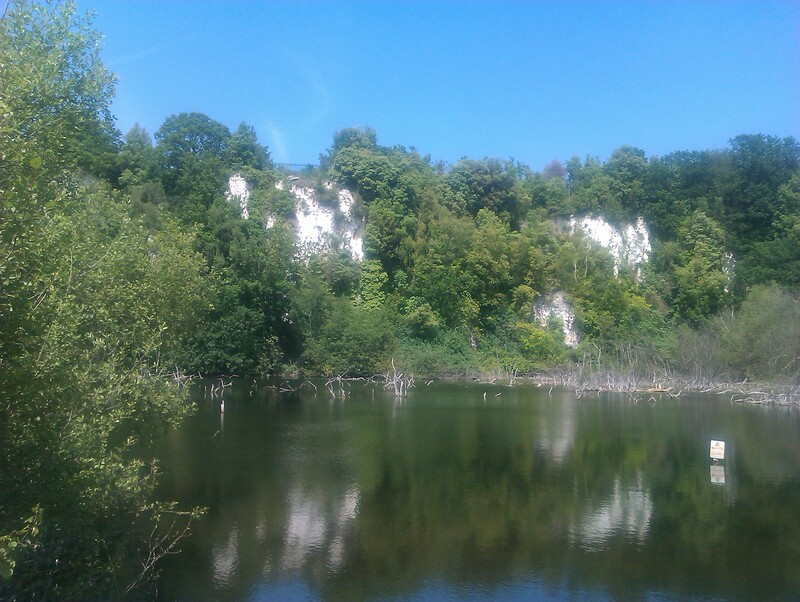 Here there are good views of the chalk cliffs. Cross the busy road. Straight ahead you will see a path and cycle way which runs between the cliffs on the left and the new houses on the right. Take this to its very end at Drake Road. Turn left into Drake Road. There are turnings to the right and left, but keep straight ahead until the road turns to the left. At this point you will see a road leading off to the Chafford Gorges visitor centre. Follow this to the visitor centre. 3). The visitor centre has a grand view over Warren Gorge and you may feel that this is view is enough for you. This is because Warren Gorge is more developed than the other gorges and you may find it a bit tame after the splendours you have seen. 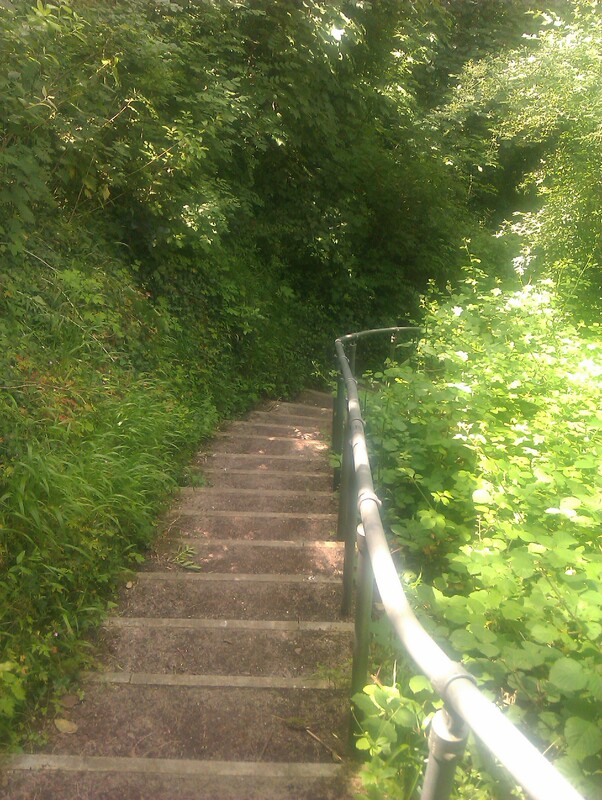 To descend to the gorge walk past the visitor centre until you come to a zig-zag path leading down into the gorge. Descend to the bottom. Once in the gorge turn left at every possible junction. Because of the shape of the southern lake you are forced round almost in a circle. But when you get to a T junction near the north-west end of the south lake do not go left. (At this point the north lake is straight in front of you. Turn right here. You re-join your outward path to return to the visitor centre. Leave the visitor centre by returning to Drake Road and turning left, going back the way you came. Do not go as far as the bike route you came up. Instead, just before this, go right up Merlin Close. Shortly afterwards you will come to a path on the left which leaves the close and then turns right. Follow this path. The path runs straight for quite a way and then turns right. It ends at a junction. Turn left here and walk down the hill on steps. These may be a bit slippery after rain. At the bottom you go through a metal gate and emerge at the road. Turn right along the pavement. Now take the first right. Initially this is tarmac, but the tarmac ends. Come to a junction. Turn left and then immediately take some steps on the right down into Lion Gorge. At the bottom turn right and walk as far as you can up this magnificent gorge. 4). At the end of the path turn round and retrace your route. Do not turn left up the steps, but keep straight on, on a path by the lake. The path leaves the lake and climbs via zig-zags to meet Phillip Sydney Road. Turn right here. A third possible alternative route (not shown on the map) is to cross Phillip Sydney Road and descend another zig zag path to examine the Lion Pit Tramway Cutting SSSI. (F) As its name suggests, this was the route of the tramway from the pit to the Thames. You will need to return the way you came to re-join the main route. On the main route come to a roundabout. To the right is Lancaster Road. Cross this. On the far side of the road you will see a path/cycle track. Turn right to follow it. For a while the track runs parallel to Lancaster Road, but it then bears left through woods to end at Mill Lane. Keep straight ahead up Mill Lane. At the end you come to a roundabout. Bear left. 5). Almost immediately you come to a signboard with a map of the gorges. Turn left down a footpath here into the ancient woodland of Mill Wood. The main route goes straight ahead, but shortly after the start alternative 4 leaves to the right, re-joining the main route just before the steps. Follow the path to its end at the top of some steps. Descend the steps. On your left you can see Mill Lane Sand Cliff. See below for more information about this. At the bottom of the steps the path bears right and joins a cycle route. Turn right along the cycle route and then Left. Arrive at Saffron Road. Turn right. Come to a roundabout. Keep straight ahead. Arrive at a second roundabout. Straight ahead after this you will find Chafford Station. 6). If you want to go on to Lakeside shopping centre there is a passage to the centre on the left hand side of the station building. Much of this information has been provided by Thurrock Council and Essex Field Club. Grays is the birthplace of Russell Brand. In the book “the Joy of Essex” he is quoted as speaking lovingly about the gorges on this walk. There is also some interesting history prior to this. From the 18th century to the end of 1950s a large proportion of Chafford Hundred was extensively quarried for Brickearth to make bricks, gravel and chalk, with flint as a side product. These were used to produce lime for mortar, whitewash and from 1870s, cement. 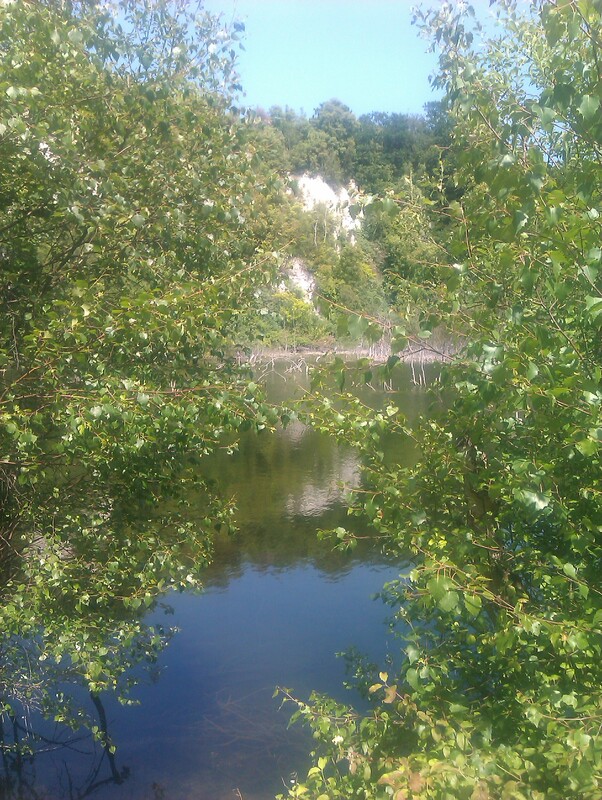 The nature park was created within the disused quarries with the Chafford Hundred housing development built around the edges. Here is a comprehensive history of Grays. (C).Lion Gorge has a large lake containing tench, rudd, pike and bream. This gorge is home to 4 different verities of bat. Dogs must be on a lead. Find out more about the gorge here. The Essex Field Club says about the site: “The tramway cutting has also produced the fossil bones of several species of mammals such as brown bear, rhinoceros, bison, mammoth and straight-tusked elephant. One of the earliest records of fossils from here was in 1890 when a partial elephant skeleton was found, on top of which was a layer of crushed ivory several metres long. Of particular interest were the cut marks on the pelvis of a rhinoceros which could only have been produced by a sharp stone tool. These marks suggest that the animal was deliberately butchered here by early humans. The walk is particularly enjoyable in the period April- July, when there is a grand display of wild flowers, but can be enjoyed at any time of year. Please note that, with great restraint, I have avoided calling this walk “50 Shades of Greys”.